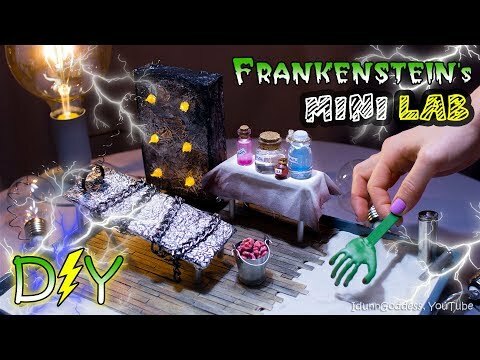 In this video I show how to make a mini DIY Frankenstein Style Zen Garden – cute and creepy stress-relief toy. Draw on the sand with miniature monster’s hand rake and relieve your stress and anxiety during Halloween holidays! This is not just a toy or decoration – this is a #miniature Japanese garden that helps with nerves and reduces stress. When you focus on drawing wavy lines on the sand – even with monster’s hand LOL – your mind rests and you feel such a great relieve! In this video I show how to make 6 miniatures for this #zengarden – mini floor with miniature wood flooring, mini capacitor (the device that stores electricity (note – the capacitor I made just mine imagination for devices of 18th century)), mini surgical bed for Doctor #Frankenstein ‘s experiments, mini stand for mini jars with chemicals, miniature brain and mini rake shaped like monster’s hand. This #DIY project is very easy, cheap and fun! I start with the base (cardboard lid with sand) and wood flooring (cardboard, double-sided tape (or any adhesive),wooden stir sticks and watercolor). Just in case – you can get the sand from any pet shop. The next DIY is a miniature electrical device – capacitor. You will need a small cardboard box, aluminum foil, LED tealights, black acrylic paint and 4 push-pins. Or you can design your own. The main to make this lab full of electrical devices. The third mini DIY – is a miniature stand with chemicals. Paper drinking straw, a piece of cardboard, white fabric painted with watercolor, old nail polish bottles and jute twine. The fourth DIY project is a mini medical-electrical bed – the place where the “Modern Prometheus” (Victor Frankenstein’s monster) was created. The fifth miniature is a mini brain. LOL Just a cherry on top for medical lab. LOL You will need a walnut and acrylic paint to make it. And the last – as always in my miniature Zen Gardens – mini rake made as monster’s hand 🙂 You will need a roll of baking paper, hot glue, acrylic paint and a popsicle stick. To decorate this mini scene I also used old batteries and pieces of wire. Have fun on #Halloween !